For the past eleven years, I have been answering numerous how-to-mosaic questions via email on a daily basis. In the early days, much of the advice I gave was essentially correcting misinformation that people had found elsewhere, specifically arts and crafts sources that wanted to make things as easy as possible in order to encourage sales. These sources of information often omitted what needed to be done to make the mosaic durable and weather resistant. Possibly they thought the extra information might make the project look overly complicated or seem like too much work. (It isn’t.) However, in some cases I think it was ignorance on the part of the authors, and so they wrote instructions for how to make outdoor and garden mosaics using materials and methods meant for dry indoor locations. I think I preferred the emails from people threatening to sue me over the emails from people wanting clear plastics to pour over doomed outdoor projects. But I have noticed a change in the type of mosaic questions I am getting via email over the past decade. 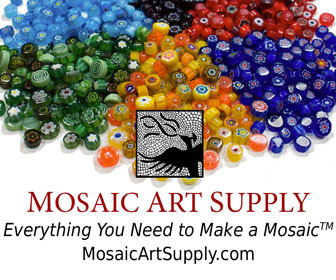 Apparently the Internet has been successful in distributing a vast amount of basic how-to information because the questions I receive now don’t seem nearly as half-baked as they did when I started Mosaic Art Supply. I can’t even remember the last time someone emailed me asking if they could use a a large stretched painter’s canvas as a mosaic backer or if food coloring could be used to color grout. Silly nonsense like that used to come in several times a day when I first set up shop. The first reason those type questions seem like silly nonsense to me is that they don’t consider non-mosaic information the person asking is almost certainly already aware of, especially since they usually introduces themselves by mentioning their experience in art or their profession. Q: Can I use a 3 ft x 4 ft stretched canvas as a backer for a mosaic of glass tiles? A: Can your canvas hold 30 to 40 pounds of anything without sagging? No. It’s fabric. Also, fabric flexes; tile does not. Q: Can I use food color to dye grout? Would it last if it worked? A: No. Grout is concrete and mildly caustic when mixed. It would eat a vegetable pigment. Besides, what’s the longest you have ever seen a spilled Kool-Aid stain last on a sidewalk before fading away? Of course, you never get to answer those type question emails quite as bluntly, but you do have to answer them, and sometimes they keep emailing back, and you actually have to explain to them why it won’t work, convince them it won’t work. That is when it truly becomes nonsense: when someone is so in love with the idea they have come up with, they want you to bless it and tell them that it will work, even though they know it won’t. As people have become more educated about basic how-to information, their questions have become a lot more relevant and practical and worth sharing with a broader audience. This entry was posted in Joe's Rantings on August 13, 2013 by Joe Moorman.